“Put that another way, because we’re definitely not organised enough to have written a company history, a mission statement or anything else like that – Why are we doing this? It all started on Cerro Aconcagua in the Andes, pretty high up at about 6200m where we had a lot of problems with our stomachs, were unable to find food you can eat and digest easily when you’re really out there. …That was in 2002. We got back to the sunny Wiltshire-Hampshire border in the New Forest, back to our makeshift office, the “Loveshack” and QMFC kitchen, and we got started on cooking up some ideas we’d had on the Andes expedition. The first bars were all over the place and wouldn’t fuel much, let alone an adventure, but they did spur us on. We kept at it most Friday afternoons, skiving off the day-job mostly and finally started getting somewhere in about late 2004. Guinea pigs are easy to find when food’s involved with bikers and climbers and so we kept trying out the bars on mates who we were out riding with and after about ten times of turning up to races and being told our bars were better than the ones on sale we thought we’d better do something about it. We formed Fuel for Adventure, because that’s exactly what it is, and started designing wrappers, getting key nutritional help from our now partner Matt Lovell who just happens to be the England RFU nutritional advisor and took the bars off to a great mountain bike race all round Scotland. The bars went down a storm. Since then we’ve been out there spending long hours cooking up prototype after prototype and getting the bars better and better and tastier and tastier and delivering more and more energy. MuleBar has summited Everest, has ridden and sponsored the incredible Absa Cape Epic mountain bike stage race across South Africa, the 2009 – 2011 Tour of Britain…the list goes on and on. The key thing is it’s Fuel for Adventure, for everybody’s personal adventure. This is what we are all about. We are trying to help everybody get out on an adventure. We strongly believe that everybody’s definition of adventure is different and that while some need to try and climb K2 or Everest or win the Tour de France, many just want to go for a ride or a walk at the weekend, go fishing or kick about on the local field. While we love rubbing shoulders with elite athletes, we actively and constantly work at grassroots levels to support all types of organisations, individuals, clubs and events. We actively believe that if you support the sport, the sport will support you. We welcome applications across many different activities, sports, causes and events and will give each one the same consideration. We can’t do everything but we will always try to help in some way. What’s in it? Does it do the business? How can it satisfy both ends of the active spectrum? – Good question. MuleBar has been used by the likes of Javi Gomez Noya, 2012 Olympic Silver Medallist 2012. The England Rugby team eat MuleBar and so do 17 of the best riders in The Tour de France. See information on our Mules for more. MuleBars work on a very simple premise: that what is natural is good. What is carefully selected for the unique energy giving potential is good. A natural mixture of ingredients made the way nature intended and picked for their broad spectrum of energy providing sugars and fats makes for the perfect bar, fuel with flavour, is good. The more processing, the more additives, the more artificial ingredients a bar has the more likely it will not make for a better energy bar, especially if talking about improving your performance and health. The same applies for any other activity too. The more additives put into a human body, the more the body has to work to process them and the more time the body is working in that way, the lower the performance level. When you’re out on the trail, when you’re competing, racing or working through a tough day, the body responds much better to foods it knows already, foods it has no problem digesting. We call our ambassadors “Mules” – no surprise there – they are duty bound to carry and use MuleBars wherever they go. No Mule is just an athlete, they are real characters who are passionate about what they do. Often they are winners in their field and are pushing the limits of their field. We have an old saying at The Stable – performance is a given – and Mules are about loving what they do. The list is growing across many walks of life so check out the full Stable. Everyday in this whole adventure we come across individuals and companies who have helped us, supplied us, given us advice or just made us laugh. We have a page on our website called Boom!, as homage to these people and their companies. 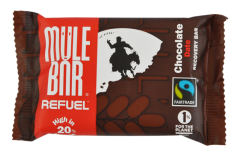 MuleBars give you energy. We can’t say it clearer than that. We use organic and Fairtrade ingredients wherever possible and are committed to having all our products totally organic and Fairtrade as soon as the ingredients are available.